All Albums are available on iTunes. Monkey Lizards (2017) All new songs and the first album from my new band! They tell stories about Kylo Wren, sunglasses that fight fascists, finding your parallel self somewhere out there in the multiverse, dying alone in the desert, and of course love. This album is available on all digital platforms. 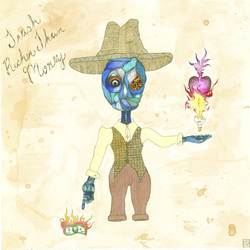 ﻿Trash Richer Than Money (2014) What I wrote and recorded my last year living in New Mexico. Songs about moving, roots, midlife crisis, and Trash. When are We Ever Gonna Use This? (2012) This album is thought of by many to be the quintessential indie-rock-nerd album all about public education ever created. I have been wanting to do this one for awhile now and here it is, filled with songs to make you laugh, cry or just scratch your head out of confusion. The World is Yours (2010) - All songs written after the birth of my first son. iTunes labels the genre of music “Alternative” but really it’s more like “Glam Folk”. Finish What You Start (2009) - My most light-hearted album. It tastes just as good as a green chile B.L.T. Includes me, Art Jarvis on Bass, Ron Romero on electric guitar and Ken Battat playing a wooden box. Songs about not being able to sleep, how hard it is to be a teenager or a dog and Charlie Brown and Lucy, who betrays him. The Life and Teaching of Guru Muru (2009) - My first real concept album. A musical guide to the important teachings of my friend and spiritual advisor, the out-of-work history teacher and former bus driver. Sort of like having coffee with Kurt Vonnegut and Pope John Paul II. 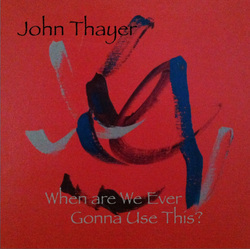 Click on the album artwork to see lyrics. It Could Always Be Worse (2008) - 14 songs. A fusion (or confusion) of country, rock, folk with a little punk and hip-hop thrown in. Ezra and Art are prominently featured on this record and my tongue is planted firmly in my cheek throughout. Border Town (2007) - I hadn’t written new songs in a while and decided to finally do a new album, in Spanglish. 11 songs including “Border Town”, “I Saw God at Frontier Restaurant”, “Sisto Abeyta for President” and a new version of “Día de los Muertos”, an old classic. Feelin’ Pretty Free (2002) - A little bit more rock than folk. This is what happened to my writing after a summer reading Noam Chompsky. 10 songs for the price of 10 songs. Tall Tales & Broke Dreams (2001) - 14 acoustic stories. Characters include Gene Simons, Darth Vader, Elian González and Alan Greenspan.